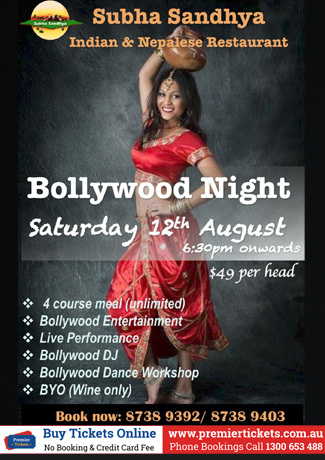 Subha Sandhya Indian Restaurant Presents Bollywood Night @ August 12, 2017 - Presenting Live entertainment and Amazing meals! We can promise you that this will be a night to remember. This night will be full of entertainment to keep you happy. Bollywood songs which will be played by the coolest DJ that set the mood right. BOLLYWOOD DANCE WORKSHOP happening – you will learn the basics of Bollywood dancing! !